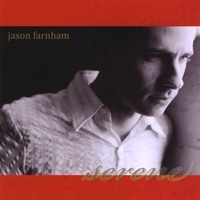 "Serene" should garner Jason Farnham some well-deserved attention and place him firmly on the instrumental music map...Recommended! ...The compositions on "Serene" are performed on piano and synthesizer, with some more orchestrated than others, and provide the listener with an hour of delightful listening pleasure... The eleven tracks bring together a nice variety of styles. "Be Thou My Vision" has appeared on quite a few piano CDs the past few years, and Farnham's arrangement is quite different from any I've heard. Its deep bass rhythm and having each verse become a variation on the theme are both effective and stirring!" "Farnham's 'Winter in L.A.' truly sounds like the first snowfall of the year coming down, and because it's in a major key, it also has that Los Angeles sunny quality to it."